Prompt access to effective malaria treatment is central to the success of malaria control worldwide, but few fevers are treated with effective anti-malarials within 24 hours of symptoms onset. The last two decades saw an upsurge of initiatives to improve access to effective malaria treatment in many parts of sub-Saharan Africa. Evidence suggests that the poorest populations remain least likely to seek prompt and effective treatment, but the factors that prevent them from accessing interventions are not well understood. With plans under way to subsidize ACT heavily in Kenya and other parts of Africa, there is urgent need to identify policy actions to promote access among the poor. This paper explores access barriers to effective malaria treatment among the poorest population in four malaria endemic districts in Kenya. The study was conducted in the poorest areas of four malaria endemic districts in Kenya. Multiple data collection methods were applied including: a cross-sectional survey (n = 708 households); 24 focus group discussions; semi-structured interviews with health workers (n = 34); and patient exit interviews (n = 359). Multiple factors related to affordability, acceptability and availability interact to influence access to prompt and effective treatment. Regarding affordability, about 40 percent of individuals who self-treated using shop-bought drugs and 42 percent who visited a formal health facility reported not having enough money to pay for treatment, and having to adopt coping strategies including borrowing money and getting treatment on credit in order to access care. Other factors influencing affordability were seasonality of illness and income sources, transport costs, and unofficial payments. Regarding acceptability, the major interrelated factors identified were provider patient relationship, patient expectations, beliefs on illness causation, perceived effectiveness of treatment, distrust in the quality of care and poor adherence to treatment regimes. Availability barriers identified were related to facility opening hours, organization of health care services, drug and staff shortages. Ensuring that all individuals suffering from malaria have prompt access to effective treatment remains a challenge for resource constrained health systems. Policy actions to address the multiple barriers of access should be designed around access dimensions, and should include broad interventions to revitalize the public health care system. Unless additional efforts are directed towards addressing access barriers among the poor and vulnerable, malaria will remain a major cause of morbidity and mortality in sub-Saharan Africa. Prompt access to effective malaria treatment is central to the success of malaria control worldwide. The Roll Back Malaria (RBM) partnership has set for 2010 a target of ensuring that 80 percent of those suffering from malaria have prompt access to, and are able to correctly use, affordable and appropriate treatment within 24 hours of symptoms onset . Most African countries are far below these targets, with only a minority of fevers being treated promptly and effectively [2–5]. The 2008 World Malaria Report states that between 2006 and 2007, only 38 percent of fevers reported among children under five were treated with anti-malarials, and only three percent were treated with artermisinin-based combination therapy (ACT) , the official first-line anti-malarial for uncomplicated malaria in over forty African countries . The number of fevers treated promptly and effectively prior to the policy change from monotherapies to ACT was equally low . Low levels of ACT uptake can be attributed to various factors including limited availability outside the public sector, high costs, poor prescribing practices, and frequent stock outs in public health care facilities [9–11]. Various initiatives to increase access to ACT have been implemented or are in the process of implementation. The Affordable Medicines Facility-malaria (AMFm) aims to enable countries to increase the provision of affordable ACT in the public, private and non-governmental organizations through co-payment at factory gate . Subsidies will be accompanied by interventions such as shop-keeper training programmes so as to increase availability and safe use of ACT in the retail sector. A pilot study of this delivery approach in Tanzania reported a dramatic increase in access to ACT . Community based interventions including the distribution of drugs by community health workers have been equally successful [12–15]. Interventions targeting retailers implemented in the pre-ACT era were effective in improving home management of fevers [9, 16–19], and looked cost-effective . In Kenya, the malaria treatment policy was changed from sulphadoxine/pyrimethamine (SP) to ACT artemether-lumefantrine (AL) in 2006 . Despite the policy change, amodiaquine remains the main anti-malarial used to self-treat fever, and is widely prescribed by health workers [22–24], even when ACT is available in health care facilities [4, 25]. The various types of ACT are 10 to 15 times more expensive than other anti-malarials [26, 27] and their availability is currently restricted to the public and formal private health sector. Plans are however underway to provide subsidized ACT in the private retail sector through the AMFm subsidy . While these are potentially good developments for malaria control in Kenya and elsewhere, existing evidence shows that the poor benefit less from malaria control interventions than higher income groups , and are less likely to seek prompt effective treatment when they fall sick [30, 31]. Given that reaching low income groups is essential for equity and for the success of public health interventions, it is important that the factors preventing low income groups from accessing interventions and effective treatment are better understood. This paper describes access barriers to effective malaria treatment among the poorest population in four malaria endemic districts in Kenya. The WHO guidelines on malaria treatment recommend that cases of suspected malaria are treated with a full effective treatment irrespective of a confirmatory diagnostic test . In this paper, prompt effective treatment is defined as ability to correctly use appropriate anti-malarials to treat suspected or confirmed malaria within 24 hours of symptoms onset. What does access to malaria treatment entail? There is no consensus on what access to health care means and how it should be measured. Existing definitions present access as a multifaceted concept, influenced by multiple interrelated factors occurring at both the supply and demand level [32–37]. 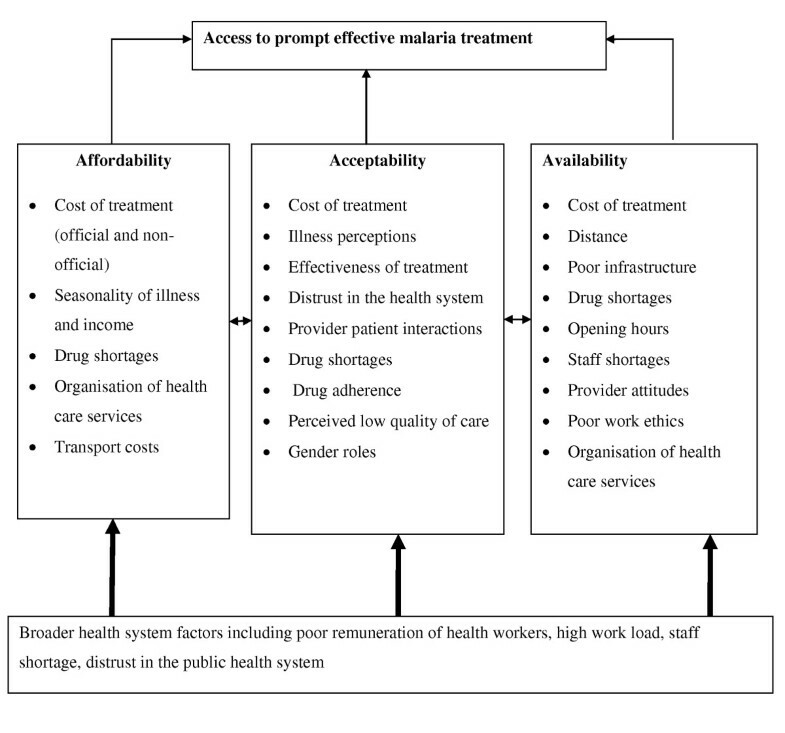 Recently, Thiede et al have developed an access framework that explores three dimensions of access namely: (1) affordability, which entails the full cost of health care vis-à-vis the ability to pay for the services; (2) acceptability, which refers to the compatibility between lay and professional health beliefs, including patient perceptions of effectiveness of treatment, and the extent to which their constructions of health and healing match health workers' understanding of these issues; and (3) availability, which goes beyond physical location of health services to include opening hours, ability and willingness of providers to serve the population as well as type, range, quality and quantity of services. Factors occurring at the different dimensions interact to influence access to health care services. Most studies that explore access to malaria treatment focus on a single determinant of access primarily distance to health care facilities, availability of anti-malarials, or utilization of health care services. However, access to malaria treatment is far broader than these indicators, with a range of demand and supply side barriers potentially hindering people from seeking prompt effective malaria treatment. In addition to financial and physical access barriers, examples of factors influencing access include perceptions of illness causation, perceived and actual effectiveness of treatment and quality of care, provider attitudes, adherence to drug dosage, power dynamics within households, and availability of good quality information. Understanding these barriers and how they interact to influence treatment-seeking among the poor is essential for improving effective case management. In Kenya, the role of distance in access to malaria treatment and morbidity levels is well documented [38–40], but efforts to understand other barriers of access have been relatively piecemeal. This paper draws on the framework of Thiede et al to consider the range of barriers to prompt and effective malaria treatment among the poorest populations in Kenya. The study was conducted in four districts in Kenya purposively selected to represent different ecology and malaria transmission patterns. Kwale district on the coast with seasonal, high intensity transmission; Bondo district on the shores of Lake Victoria with high intensity perennial malaria transmission; Gucha district representing the low seasonal transmission conditions of the Western highlands; and Makueni, a semi arid district with acutely seasonal, low transmission. There are also a wide range of research activities going on in the districts as part of monitoring Kenya's progress to the Abuja targets [41–43]. According to the 1999 population census, the total population living in the districts are 952,752 people in Gucha, 952,000 in Kwale, 238,000 in Bondo and 771,545 people in Makueni . Gucha district is the most densely populated with a population density of 706 persons per square kilometre, while Kwale is the least densely populated with a population density of 60 persons per square kilometre. The population density in Bondo and Makueni is 240 and 93.8 persons per square kilometre respectively. The proportion of children aged below five years in the districts ranges from 14% in Makueni to 17.3% in Kwale. The main ethnic groups in Kwale and Bondo are the Mijikenda and the Luo respectively. The Abagusii are the main ethnic group in Gucha, while the Akamba are the main residents of Makueni. Agriculture is the main source of income in all districts. Additional information on the study districts is provided elsewhere [45, 46]. The data presented in this paper come from a broader study that aimed to explore barriers to effective treatment and prevention among the poorest populations in Kenya. Multiple data collection methods were applied in the wider study to enhance reliability and validity. They included a cross-sectional survey (n = 708 households), focus group discussions (n = 24), semi-structured interviews with health workers in-charge of primary health facilities in the districts (n = 34) and patient exit interviews (n = 361). The results presented in this paper are mainly from the FGDS and patient exit interviews, although data from the cross-sectional survey are presented where necessary to provided quantitative data on key variables of interest. The cross-sectional survey collected data on self-reported fevers, treatment-seeking behaviour, treatment barriers, costs and sources of money for treatment. Focus Group Discussions (FGDs) explored barriers to access in more detail, gathering in-depth information on the interaction between different factors and how they influence access to prompt and effective treatment. Interviews with health workers and patient exit interviews gathered providers and facility users' perspectives on various aspects related to the access dimensions, including facility opening hours, availability of drugs and provider-patient interaction. Survey households were selected using multi-stage sampling. A detailed description of the sampling approach is published elsewhere [45, 46], but briefly: First locations-the 2nd lowest administrative unit in Kenya-were selected using poverty indicator maps generated by the Kenya National Bureau of Statistics . Second, four enumeration areas (EAs) located in the two poorest quintiles in each district were randomly selected. Third, a homestead list was updated and all homesteads in the EAs were selected to take part in the study. Finally, all households in the homestead were included in the study. A two-week recall period was used to collect data on self-reported fever (indicator for malaria) and treatment-seeking patterns. FGDs participants were selected from the same areas on the basis of age and gender. Priority was given to men and women of reproductive age because children are more vulnerable to malaria in the study settings . A few FGDs included older men and women because of their important role in treatment-seeking decisions [49, 50]. Participants were drawn from different parts of the village to maximize diversity. FGDs were conducted up to the point of redundancy (n = 24). All FGDs were tape recorded and notes taken for in-depth interviews. Primary health care facilities were selected purposively based on their proximity to the EAs, and semi-structured interviews were held with all available health workers. Patient exit interviews were conducted with all individuals who sought care from participating health facilities on the date of the interview. Quantitative data were double entered into Microsoft visual FoxPro (version 9.0) and transferred to STATA (version 9.2) for analysis. FGDs were transcribed and analysed manually using content analysis. Data were first analysed separately for each district and then brought together to identify cross-cutting issues. The findings were grouped together to give an indication of the overall barriers that residents living in malaria endemic areas face since key themes were generally similar across the districts despite differences in malaria endemicity. To ensure trustworthiness, two researchers independently read and re-read the transcripts to identify codes, subthemes and themes. Findings are organized around three broad access dimensions common across various analytical frameworks [32–37]. Within each dimension, there are a number of factors affecting both demand and supply side determinants of access, although these factors do not operate independently as demonstrated in Figure 1. Quantitative data on each dimension are first presented to provide a general overview of the determinants of access at the community level, followed by qualitative data which provide more detailed insights into the access barriers, some of which are difficult to quantify. A summary of factors influencing access to prompt effective malaria treatment. Ethical approval was obtained from the Kenya Medical Research Institute (SSC No. 964), and the World Health Organization Research Ethics Review Committee (ID A50045). A summary of self-reported fevers and treatment-seeking patterns is presented in Table 1. Fever was reported in 506 households (71.5%). A total of 1074 individuals (25.5%) reported fever in the two weeks preceding the survey. More fevers were reported among children under five years of age than among older children and adults (33.1% and 23.9% respectively). More than 90 percent of reported fevers were treated; treatment levels were high for both fevers reported under fives and the rest of the population (91.5% and 90.6% respectively). Most fevers were treated within the first two days of symptoms onset; 86.0% of fevers reported among children under five and 83.3% of fevers reported among the rest of the population were treated within the first two days. Treatment-seeking patterns among survey households. The informal sector was the main source of treatment for all age groups. About 32% of fevers reported among children under fives were treated using drugs bought from the shops, 15.3% were treated using drugs bought from chemists and 5.5% were treated using herbs. Among adults, 37.7% of reported fevers were treated using drugs from the shops, 17.0% using drugs from the chemist and 7.4% were treated using herbs. Only a minority of fevers were treated at public and private health care facilities (39.0%). The proportion of fevers treated in a public health facility was 29.3% for illnesses reported among children under five, and 19.2% for illnesses reported by older children and adults. Private health facilities were hardly used, with only 8.7% of all reported fevers treated at either a private or faith-based facility. Children aged below five years were more likely to receive treatment at a formal health care facility than other age groups (p = 0.001). Affordability is also commonly known as financial access [33, 34, 37]. The cross-sectional survey identified lack of money as a major barrier for seeking treatment: 61.5% of individuals who did not seek treatment reported that cash shortage was the main barrier (Table 1). Individuals who treated fevers were asked if they had enough money to pay for treatment. In 40.0% of all treatment actions taken, money was not readily available at the time of seeking treatment (Table 2). Lack of cash was common among both individuals self-treating using drugs from the shops (38.9%), and those that sought treatment in the formal sector (41.8%). Where cash was not readily available households adopted different coping strategies (Table 2). Borrowing was the main source of cash for treatment (25.4%). Money was mainly borrowed from friends and neighbors (38.5%), and from relatives (36.9%). Other coping strategies included being treated on credit at a health facility (17.6%), gifts (10.1%) and sale of assets (10.0%). Sale of labor was hardly used as a source of money to pay for treatment, but it was the main source of money for paying debts that arose due to the treatment-seeking (41.3%). Assets were also frequently sold in order to pay for illness related debts (41.3%). Sources of money to pay for treatment. Money borrowed/credit paid back at the time of survey? Acceptability is sometimes referred to as cultural access . It involves the interactions between the health care system and service users, provider and patient attitudes, and expectations of each other [32, 51]. It also includes the compatibility between lay and professional health beliefs, patients' perceptions of effectiveness of treatment, and the extent to which their constructions of health and healing match health workers' understanding of these issues . The cross-sectional survey collected data on individuals' satisfaction with the quality of services received at formal health care providers as an indicator of acceptability. The results indicated that 311 individuals (55.0%) who sought treatment from formal health care providers were satisfied with the services; 209 (36.9%) were dissatisfied and; 45 (8.0%) were indifferent. The main reasons given for the dissatisfaction were the quality of drugs received (23.2%) and lack of drugs (23.2%); low confidence in staff ability to offer good quality treatment (17.8%), and lack of diagnostic tests (10.1%). Satisfaction with services was linked primarily to availability and effectiveness of drugs, confidence in staff, and short waiting time (69.1%, 13.1% and 3.6% respectively). "It is their qualifications that we doubt.... The young boys are not good but the older providers who worked here before were good. We feel the drugs are there but they do not know how to diagnose diseases and administer appropriate medication. They do not know how to hold the syringe; they hold it like it is some pen for writing" (FGD, Female). Availability (or physical access) refers to whether health services and providers are supplied in the right place at the right time, and whether the services offered correspond with population's needs [32, 33, 35, 37]. Key availability themes that emerged were facility opening hours, drug shortages, and location and organization of health services. One out of the 34 facilities covered was reported to operate 24 hours, seven days a week. Most opened at 8.00 am every day (n = 28), and closed at 4.30 pm (n = 19). In 20 facilities, health workers reported being contactable for emergency services out of hours through mobile phones. In 10 facilities, the in-charge reported having had to close the facility, either to attend a workshop (n = 3), when summoned to the district headquarters by the district medical officer for health (n = 2), or during annual leave (n = 3). These facilities were operated by only one health worker and, consequently, there was no one to offer services in their absence. Others felt that health workers did the best they could under the circumstances. Some facilities were understaffed, some had only one health worker, and in their absence the health facilities remained closed or were operated by community health workers. Drug availability is another key factor influencing access to treatment. Individuals who sought treatment from public health facilities in the two weeks preceding the survey were asked if they received all the prescribed drugs from the hospital pharmacy and whether or not they were issued with a prescription to buy drugs from a private chemist. The results indicated that 95 (30.0%) of people who visited public health facilities did not get drugs from the hospital pharmacy and were issued with a prescription to buy drugs elsewhere. Of these, only 31 (32.8%) individuals bought the prescribed drugs. Among exit interview participants, 140 (38.8%) did not receive drugs from the facility because they were out of stock. The way health care facilities are structured may promote or hinder use of health care services and thus act as a barrier to effective malaria treatment. Seeking treatment from public health facilities was reportedly an unnecessarily long and frustrating process, involving a number of stages. Patients typically: pay the registration or card fees; take the card for stamping and sometimes pay a stamping fee; see the health worker who might recommend a parasitaemia test; go to the laboratory and then return to the health worker with the results; and finally go to the pharmacy to receive available prescribed drugs. Each stage can involve significant queuing and delays, making the system cumbersome, with negative implications for patients trust in the providers' and in the health system. This paper applies an access framework to explore access barriers to effective malaria treatment among the poorest populations in Kenya. Here, the results are discussed in more detail and compared to the wider literature on access to health care. Access to malaria treatment is clearly influenced by multiple factors occurring at both the supply and the demand level. A summary of the interrelated barriers to access identified in this paper is provided in Figure 1. Overall, a positive finding was that most reported fevers were treated within the first 24 hours of symptoms onset. Like in many parts of sub-Saharan Africa, over 50% of reported fevers were treated using drugs bought in the informal sector, with only about 20% treated in the public sector, the main source of formal care in the study settings. In Kenya, Coartem, the first-line anti-malarial, is not sold in the informal sector, implying that a high proportion of fevers treated in this sector were not treated effectively. Moreover, evidence suggests that even fevers treated in the formal public sector in the recent past have hardly been treated using the recommended anti-malarials [3, 4, 24, 52, 53], due to various reasons related to all access dimensions including drug shortages, patient's preferences and perceived high costs of drugs . Additional data on the types of medicines used to treat malaria in the era of ACT, and the level of adherence to drug regimes would be useful in measuring the country's progress towards the Abuja targets. Affordability is a major barrier to malaria treatment and health care throughout sub-Saharan Africa. On the demand side, health care charges, seasonal incomes, transport costs and waiting time all interact to make affordability a major barrier for the poorest households. Ready cash to pay for treatment was hardly available and households often mobilized additional resources mainly through borrowing from their social networks. Lack of money contributed to poor drug adherence since health workers and drug shops were reported to readily issue incomplete dosages. It was also reported that people who lacked money to pay for treatment were given inappropriate drugs at government facilities because they were reportedly cheaper than the recommended anti-malarials. Poor prescribing practices and drug adherence has potential implications for drug resistance and acceptability of services. For example, drug effectiveness was one of the factors that patients attributed to the satisfaction or otherwise of health services. Incomplete doses and less effective drugs are likely to clear the symptoms in the short-term, with the possibility of a recurring episode. As shown by the findings, recurring illnesses that are treated with incomplete doses or ineffective drugs can erode the trust in the health system, and thus impacting negatively on acceptability of health services. All public health facilities in Kenya charge user fees. In an attempt to make malaria treatment affordable, the Kenyan government provides free anti-malarials to all public health care facilities, which ideally should be dispensed free of charge to malaria patients. Malaria treatment is therefore, officially free to all Kenyans. In a further development, in 2004, registration fees for malaria patients in all primary health care facilities were eliminated. 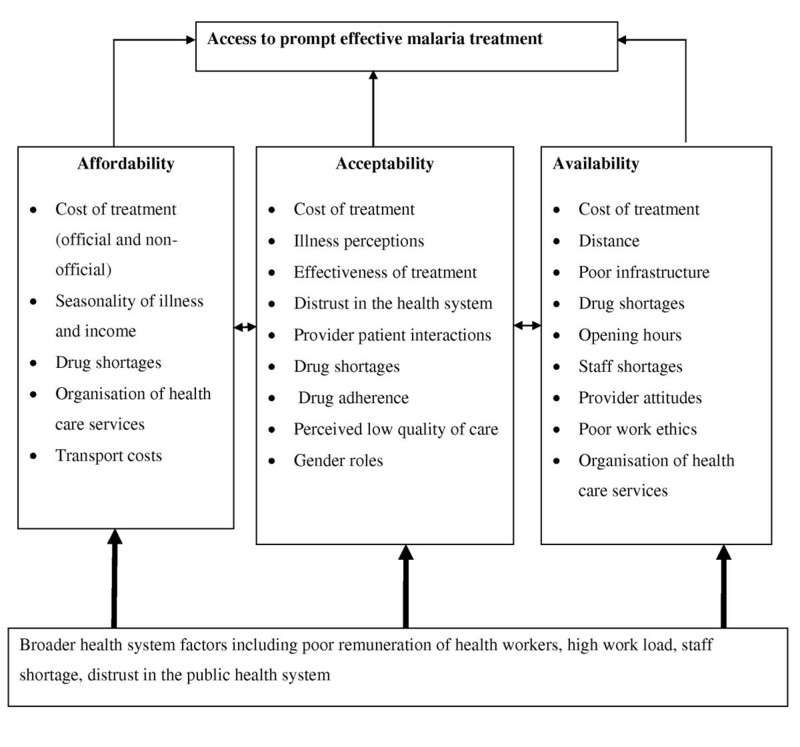 However, the findings presented in this paper and elsewhere suggest that health care charges remain a significant barrier to access and that the 'free treatment' policy is not fully implemented for various reasons including : (1) poor policy design, where patients are required to pay consultation fees before being seen by a health worker; (2) low revenue, especially in districts where malaria is the main illness. Exempting malaria patients from paying fees in malaria endemic districts impacts heavily on the amount of revenue collected; (3) the difficulties of identifying patients suffering from malaria since many illness conditions have symptoms similar to malaria and many primary health care facilities do not have laboratories and; (4) shortage of drugs supplied by the government meant that facilities had to raise additional money through charging fees in order to raise money to purchase drugs. The government should work closely with health workers, district health management teams and health facility committees to ensure that people do not pay for anti-malarials in the public health sector. Non-health related interventions that address insecurity and fragility of income sources can have a significant role in minimizing affordability barriers and improving effective treatment . Regarding acceptability of treatment, about half of the people that sought care from formal health services reported that they were satisfied with the quality of services. Availability and effectiveness of drugs were the main factors given for satisfaction with health services. However, many community members in the study setting appeared to have strong negative perceptions of health workers attitudes and their ability to provide good quality care. Health workers were often reported to be disrespectful to patients and their qualifications were sometimes questioned. Such perceptions may often relate to cultural beliefs, which affect provider-patient interaction, but also demonstrate the reluctance to accept new health workers following transfer of more familiar and trusted staff. The fact that the negative perceptions towards health workers' age, gender and qualifications were expressed mainly by elderly women implies that they may have considerable cultural concerns, firstly, in exposing their bodies for injection to providers who were predominantly young males, and secondly, in tolerating the language of providers, which they regard as disrespectful to their age and social status as married women. In districts where CHWs assisted health workers to provide services at the facility level, community members expressed concerns regarding their expertise, and they were reluctant to be attended by CHWs who were mainly from the same community and well known to them. These findings demonstrate the challenges of using CHWs to support health workers in resource constraints regions. Plans are under way in Kenya to roll out the community health strategy that heavily relies on resources at the lower level, including CHWs, to improve the health status of the population. The success of this strategy will to some extent depend on the degree of CHWs acceptability at the community level. Although the impact of negative perceptions of access to effective malaria treatment is difficult to measure, treatment-seeking behaviour has been shown to be strongly influenced by social relationships. People draw heavily on their social networks for advice; advice that is shaped by perceptions and rumors about health workers, quality of care and the health system in general [55–57]. Gilson notes that provider-patient relationships are influenced by patients' attitudes towards providers . For example, providers personally known to patients or of the same ethnic group or gender may be more trusted. However, providers may also introduce or reinforce negative patient perceptions through their own practices . Health system constraints, such as poor remuneration, high workload and staff shortages, also play an important role in influencing provider-patient relationships . Although the role of provider patient relationships in hindering or promoting access is well documented [59–61], interventions to improve the situation are inadequately considered in policy design, particularly in low income countries. In high and middle income countries, mechanisms such as patients' rights charters exist to provide information to service users and improve on provider-patients relationships [62, 63]. Similar initiatives have been introduced in Kenya but the extent to which the needs of the poor and vulnerable populations are met has not been documented. Building trust in the public health system through improving quality of care, making providers more accountable to service users, and listening to community voices are essential to promoting acceptability. Such interventions require long-term planning but a potential starting point should be a clear commitment and willingness by policy makers to work towards promoting and revitalizing the public health system. On the supply side, the main barriers to access included facility opening hours, distance to health care facilities, poor road networks, drugs and staff shortages. About a third of individuals who sought care from public health facilities did not get drugs from the hospital pharmacy because they were out of stock. Over half of the people issued with prescriptions to buy medicines outside the hospital pharmacy did not buy them. People were particularly concerned about the chronic drug shortages in public facilities, shortages that were mainly attributed to inappropriate use by health workers. Participants also reported that these shortages were more serious during the wet season when the number of malaria cases was high and health facilities could not cope with the increased demand in malaria treatment. Drug supplies were not adjusted to sustain the increased demand. Lack of drugs can impact on acceptability of health services. When people do not receive the appropriate drugs due to frequent stock out, they develop negative perceptions of health workers and have limited trust in the health system. Drug shortages also contribute to high costs of treatment, and thus impact on affordability. Drug shortages in public health facilities mean that people have to buy drugs from private chemists often at a higher price, despite already having incurred some charges - for example consultation and laboratory fees - at the facility. It is worth considering the organization of health care services to ensure that people only incur charges at the health services if drugs are available. Shortage of first-line anti-malarials has been reported as a main problem in the Kenyan health system [11, 24, 45, 53] and elsewhere in SSA [3, 52]. A recent study conducted in Kenya revealed that : 26 percent of public health facilities studied did not have any of the four AL weight-specific packs in stocks and 75 percent had at least one weight specific pack out of stock; a large proportion did not have packs for the youngest ages (the most vulnerable group to malaria); and some facilities reported not having ACT for close to two months. It is not clear why public health facilities experience chronic drug shortages, but it is stipulated that the drug supply system in Kenya is very inefficient. Other reasons include seasonality of illness, failure to account for differences in district health needs when designing the drug kits and delayed supply . The Kenyan government is aware of the drug shortage problems in public health facilities and plans are under way to change the drug supply system from one where facilities receive standard drug kits, to a pull system where facilities order their drugs based on their need. The new approach has been piloted in some parts of the country, although there is no information on its effectiveness. It is important that the new drug supply system is evaluated to ensure that it contributes to improved drug supply in the public health care system. Distance to health facilities and poor road networks was not only a barrier to the community seeking care, but they also influenced the presence of health workers at the health facility. The public health facilities discussed in this study are located in some of the remotest areas in the districts with no housing facilities for the health workers. Consequently, many of the health workers resided in neighbouring towns and they often used public means of transport on a daily basis, transport that was heavily unreliable, and hardly operated during the rainy season due to the poor road conditions. Few studies have documented the impact of physical infrastructure on health workers ability to provide good quality services. While it is difficult to confirm whether provider lateness was mainly due to poor road network and unreliable transport, the findings demonstrate the relationship between availability and acceptability. Community members attributed lateness of providers and few working hours to poor work ethics and limited interest in their work and rarely associated it with some of the constraints faced by health workers. Primary health care facilities were the main sources of care in the study settings. These facilities only operated within certain hours and remained closed during the weekend. Beyond the official opening hours, there was no source of formal care in these settings. Geographical location of health care facilities has been reported as a barrier to malaria treatment in Kenya [40, 42, 64], but few studies identify primary health care facilities opening hours as a barrier to effective treatment. The findings have shown that primary health care facilities remain closed during the weekends, and other periods when the sole health worker is not available due to official or personal commitments. Yet these facilities are the closest to the population and are the only formal sources of treatment for the poorest population. Policy makers should reconsider the operating hours of primary health care facilities in remote rural settings. Other interventions that can address the availability barriers include providing mobile clinics and outreach programmes. These interventions will, however, require that additional health workers are deployed to these facilities and that appropriate anti-malarials and other essential drugs are readily available. Table 3 summarizes the possible policy actions to addresses barriers to effective malaria treatment identified in this paper. These actions involve the three access dimensions and include both short-term and long-term interventions. Interventions relating to the broader health system are also identified. Policy actions to address barriers of access to prompt and effective malaria treatment. A limitation of this work is that the findings are based on comments and reports of samples of people living in four poor rural settings in Kenya. Although the aim was to understand barriers to access among the poorest population, the urban poor might face different barriers due to contextual differences related to better infrastructure and more health care facilities. Regarding formal treatment, people discussed public health facilities far more than private facilities. This is most likely because no private providers operated in close proximity to these low income settings. However, the fact that people did not discuss about treatment in the private formal sector suggests that this sector is beyond the reach of the poorest population. Ensuring that all individuals suffering from malaria have prompt access to effective treatment is a major challenge for resource constrained health systems. Policy actions to address the multiple barriers of access should be designed around all dimensions of access, and should also include broad interventions to revitalize the public health care system. Unless additional efforts are directed towards addressing the barriers to access among the poor and vulnerable population, malaria will remain a major cause of morbidity and mortality in SSA. This work received financial support from the Multilateral Initiatives on Malaria through the UNICEF/UNDP/World Bank/WHO Special Programme for Research and Training in Tropical Diseases (Project A50045). The paper is published with the permission of the director KEMRI. JC and CM were involved in the conception and design of the study. JC and VO participated in data collection, analysis and write up. JC wrote the first draft; all authors commented on drafts, read and approved the final manuscript.